Very popular with our customers working at Los Alamos & Sandia weapons labs, this unique coffee mug is a direct reprint of our 16 oz. (454 gram) Plutonium Oxide chemical container. 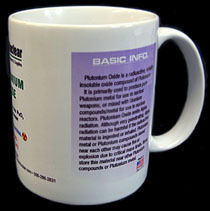 Although no one other than our Government customers can actually purchase the real material, anyone can own the mug. 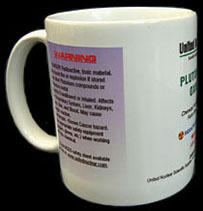 Wrap-around design completely envelops the mug in graphics & text. 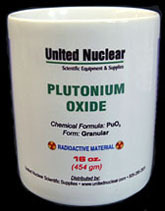 Contains the warning & handling information as well as basic info on Plutonium Oxide. For those unfamiliar with it, Plutonium Oxide is an exceedingly dangerous & toxic material from which Plutonium metal can be made - the main component of all modern nuclear weapons. Guaranteed to be an instant hit at the office. Like all our mugs, this one is printed in full color, on a high gloss, 12 ounce ceramic coffee mug - dishwasher safe of course.